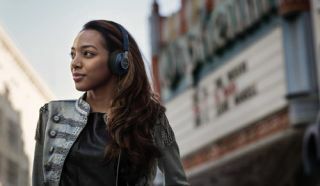 Philips launches Citiscape Downtown 'Denim' headphones | What Hi-Fi? Philips has announced the availability of updated Citiscape Downtown headphones in several new 'denim' finishes. The Philips Citiscape Downtown Denim models are due for release later this month and come with a £60 price tag. Forming part of a collaboration between Philips and Noisey, Vice magazine's new music channel, the new range of headphones build on last year's Citiscape Downtown models and are part of the You Need To Hear This campaign. Available in a range of colours – black, green and blue – the new Philips headphones come with a denim headband and claim to be "inspired by the fashions and lifestyle of New York City". The Philips Downtowns' aim to retain the collections' comfort factor and sound quality, while the company’s Music Seal technology serves to add extra noise-isolation. With a focus on audio performance, the Citiscape Downtown headphones feature 40mm drivers that Philips says have been engineered to reproduce "clean, detailed yet natural sound". The ear cushions are also said to feature "acoustically tuned memory foam" with "breathable materials", ideal for extended listening. You can switch from music to answering phone calls using the built-in microphone and controls while the 1.2m flat cable has been designed to stay knot free. The new Philips Citiscape Downtown headphones in denim are due out later this month.